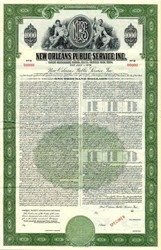 Beautifully engraved specimen certificate from New Orleans Public Service, Inc dated 1944. 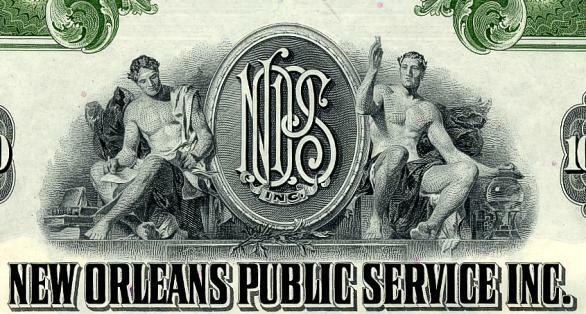 This historic document was printed by American Bank Note Company and has an ornate border around it with a vignette of two allegorical men on the sides of the New Orleans Public Service Logo. This item is over 52 years old. The origin of NOPSI can be traced back some 170 years ago to the 1820s, when an actor entrepreneur named James Caldwell opened his American Theatre on Camp Street, lighting it with gas chandeliers. Spurred by success, he founded the New Orleans Gas Light Co. By 1833 he was providing manufactured gas to a few street lights and a hotel. Armed with an exclusive grant from the legislature, Caldwell built the first commercial gas plant in the Deep South. The gas was made from coal. New Orleans was one of the earliest cities in the U.S. to have a public gas system. Less than 50 years after gas lighting was introduced to the city, the era of electricity began. The Southwestern Brush Electric Light and Power Company was incorporated in New Orleans on June 11, 1881, and was the first company to generate and distribute electricity in" the city. The company began operating January 8, 1882, and by the end of that year had installed 12 generators serving 480 of the brilliant electric arc lights invented by Charles Brush, almost all of them being used for street lighting. The Edison Electric Illuminating Company was the first electric company in New Orleans to provide incandescent lighting and other power needs. The company was chartered on August 17, 1886. The decades that ushered in present-day NOPSI were chaotic. By 1900, more than 200 different gas, electric, and streetcar companies had operated in New Orleans since 1834. The resulting inefficient and wasteful duplication of service led to ruinous competition and financial problems. By 1919 the principal utilities were financially unstable and under federal receivership. By early 1921 a federal receiver appointed the city's professional and business leaders as the "Citizen's Committee of Forty" to study the situation and suggest a solution. They recommended the formation of a single utility to provide electricity, gas, and transit. In April 1922, the New Orleans City Government passed the Settlement Ordinance under which a new company could be created from the receivership. The Ordinance set up controls to bring the new company and the city into a partnership. Later in the year the entity was born as New Orleans Public Service Inc. On August 8, 1922, the newly formed company made its first incorporation by acquiring New Orleans Railway and Light Co. By September 27, it had taken over a number of subsidiaries and began operation. Consumers Electric Light and Power Company, which served the central business district and portions of residential areas; Citizens Light and Power Company, Inc., which served primarily the Carrollton section; and New Orleans Public Service Inc. (1925), which served other parts of the city. The creation of NOPSI finally ended a series of buyouts, bankruptcies and consolidations since 1835 that involved no fewer than six gas companies, thirty transit and street railway systems, and 18 electric or consolidated electric, gas, and street railway companies. The founding of NOPSI coincided with a leap in the consumption of electricity. In 1921, the year before the first NOPSI was founded, there were 43,000 electric meters in all of New Orleans. Five years later there were 86,000, The vast majority of 1921 customers were commercial, industrial, and government. The average customer used roughly 2,500 KWH per year, and the average residential customer used 319 KWH per year. From 1926 to 1939 - an era dominated by the Great Depression - electrical usage increased 400% while the number of customers barely doubled. During that same period the cost of electricity fell 72%, so the average residential user's total electric bill remained about the same despite the huge increase in consumption. This reduction in cost is attributable to efficiencies of new technology and economies of scale. From 1923 to 1985 the average residential consumption of electricity in New Orleans increased 3,000%. While the city's demand for electricity grew at an enormous rate from NOPSI's founding onward, the city's entire generating capacity continued to be housed in the same Market Street generating station. Finally, in 1947 the Industrial Canal Generating Station was completed. It was renamed the A.B. Paterson Station in 1952. The last of three units at Michoud was completed in 1967. Since the late 1960s NOPSI has experienced a lack of growth, and no further generating capability has been added. The 1970s were characterized by the energy crunch caused by the Arab oil embargo. With the trend away from natural gas and oil toward what was thought to be at the time more economical coal and nuclear fuels, the company committed itself to participation in the Grand Gulf Nuclear Plant along with MSU's other utility subsidiaries. With the growth in demand for electricity disappearing as the plant was being constructed, the need for it was continually questioned. This was one of the major issues of the 1980s and resulted in the New Orleans City Council in 1983 appointing a Citizens Task Force to look into the feasibility of the city municipalizing or taking over electric and gas operations in Orleans Parish. Ultimately NOPSI remained in private hands (except for the purchase of its transit operations in 1983 by the Regional Transit Authority), but in 1985 voters in Orleans Parish chose to return regulation to the New Orleans City Council from the LPSC. NOPSI has an agreement similar to LP&L whereby NOPSI is committed to purchasing 17% of the power of the 90% of the Grand Gulf nuclear plant that Entergy owns through its System Energy Resources subsidiary. This power helps make up any shortfall that NOPSI's own plants cannot produce. History from New Orleans Public Library and OldCompanyResearch.com.